The ON3P Steeple 108 Skis are backcountry tools for those who love going up, but feel even more strongly about enjoying the down. With the surfy, smooth ride ON3P has always been known for, the Steeple 108 features a revised RES sidecut designed to put more edge on the snow for sketchy side hill traverses and harder spring and wind-scoured conditions. A special scallop-shaped tail lets you attach climbing skis without resorting to special tail hardware. Freeride Rocker  Larger tip rocker combined with a shorter, lower tail rocker and camber underfoot. Great for driving the ski while maintaining the stability needed to remain confident at speed. Elliptical Rocker Profile  The rocker profile and tip shape are combined into one progressively changing elliptical arc, which allows the tips to plane faster in powder, deflect less in variable snow, and helps the effective edge running within the rocker length to engage in a natural, effortless way. Tour Flex  Similar to ON3P's Freeride Flex, but with a rounder underfoot platform designed for improved float and maneuverability in softer conditions. Reverse Elliptical Sidecut (RES)  RES is a large, convex elliptical arc that runs from boot center to tip taper, combined with a long, traditional sidecut radius in the tail. The goal is simple: create the best soft snow sidecut and shape available. Think of RES in two parts. In the front half of the ski, the sidecut moves outward and tightens as it approaches the tip. This exaggerated, reverse sidecut ensures the skis remain catch-free in powder and provides optimal soft-snow performance. Conversely, traditional sidecut in the tail gets you easily to and from the lift. When and RES ski is laid on edge, the RES tip and traditional sidecut tail work together to form a turn radius that provides the skier with surprisingly strong edge hold. Tip Taper  Tip taper allows for a smoother release on turns, decreased swing weight, and a less catchy ride feel in variable conditions. Used throughout the ON3P line and matched with their rocker profiles to maximize effective edge while maintaining maneuverability. Bamboo Core  The heart of every pair of ON3P ski is a FSC-certified, vertically laminated, 100% bamboo core. Bamboo provides a responsive, yet damp characteristic to their skis that we have grown to love. Tour Layup  A redesigned, thinner core profile supports the two layers of full-width carbon fiber results in a lightweight, tour-oriented ski. Carbon Fiber  Provides strength, rebound, responsiveness, and stiffens torsionally and longitudinally. Extra Wide Binding Mat  An additional layer of fiberglass mat prevents pullouts. To ensure proper coverage for all types of hole patterns, ON3P runs their mat full width on every ski they make. Their binding mat is double-biax fiberglass, increasing torsional stiffness. Unidirectional Carbon Stringer  Each ski incorporates unidirectional carbon around the core, adding pop, stiffness, and dampness without any significant increase in weight. Tri-Axial Fiberglass  19 oz or 22 oz Tri-axial Fiberglass provides torsional and longitudinal stiffness, ensuring proper edge hold and power transfer. Vibration Dampening Strips (VDS)  VDS rubber is applied to the edges and sidewalls, acting as a shear layer that provides improved bonding strength and vibration dampening. UHMW Sidewalls  UHMW (Ultra High Molecular Weight Polyethylene) is an incredibly strong material, has a higher abrasion resistance than steel, and resists cracking (unlike ABS). 1.8 mm 4001 Durasurf Sintered Base  ON3P's Durasurf 4001 base material provides their skis with better glide and protection from damage compared to any other sintered and extruded base material, and is 50% thicker than the industry standard. 2.5 mm x 2.5 mm Extra Thick Edges  ON3P uses a 3/4 wrap for their 2.5mm x 2.5mm Rockwell 48 steel edges. The 3/4 wrap allows the tips and tails of the skis to flex, decreasing the risk of delamination. 3/4 Wrap Edges  The edges don't wrap all the way around the tips and tails the way other brands build skis. The perceived durability is a marketing gimmick -- 3/4 wrap edges allow the tips and tails to flex naturally, which prevents delamination. Nylon Topsheet  Sublimated nylon topsheet is chip-resistant to ensure you always look your best. Skin Clip Tail  Specially shaped tails ensure that your skins aren't going to fall off on the ascent, and allows for easy application of skins in deep snow: just place the tail on your boot, put the tip clip on, and pull down. A short section of edge in the tail keeps your skis from getting chewed up by the tail clips. Factory Finishing  A meticulous 32 step finishing process -- including a perfect, two-part base structure, hot wax + four hour hot box treatment, and a polished, beveled, detuned edge, allows skiers to mount and ski every ON3P out of the wrapper. Made in Oregon  Every single pair of ON3P Skis is built by an ON3P employee in their Portland, Oregon factory. No shortcuts or OEM here -- they do it themselves. Design, build, sell. All-Mountain All-mountain skis are designed to handle anything you throw at them including powder, ice, groomers, steeps, heavy snow, and everything in between, but they aren’t necessarily a master of any one terrain. If you’re only going to own one ski to do it all, this is what you want. All-mountain skis generally have what we call mid-fat waists that range from 80-110 mm. Alpine Touring Also known as backcountry skis, alpine touring (AT) skis are designed for going uphill as well as downhill. These skis are typically light for their width and many feature fittings that accept climbing skins. 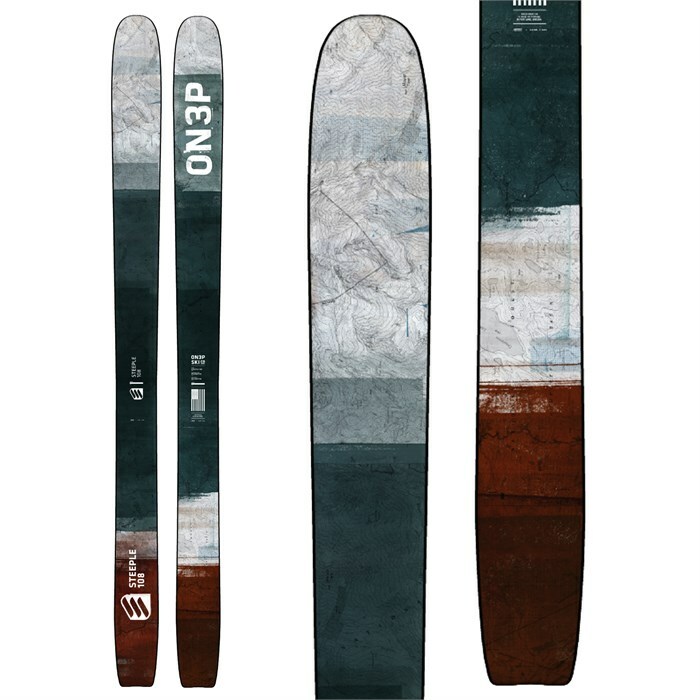 AT skis vary in width and weight, with the wider heavier versions usually used for winter/deep snow touring and the skinnier, lighter skis usually used for spring/summer/long distance touring.